With an estimated two-thirds of the world’s fish stocks believed to be either fished at their limit or overfished, according to the UN Food and Agriculture Organisation (FAO), turning to sustainable aquaculture practices like fish farming is as much of an economic necessity as it is a noble conservation effort for countries like Chile. Ranking as the world’s second-largest producer of salmon after Norway, the country’s exports of this increasingly popular and sought-after source of healthy protein totalled over US$4 billion in 2014, making it the nation’s second most valuable export commodity after copper. Naturally, serving the country’s primary export markets in the U.S., Japan, China and Europe requires a highly efficient supply chain and distribution network, along with highly durable and reliable packaging machinery to get its valuable product to global customers in pristine condition. To take care of the packaging side of things, the country’s largest salmon farmer and producer has recently turned to the Toronto-based Plexpack Corp., a well established family-owned business enjoying industry-wide respect for the high-quality design and construction of its Emplex range of automatic bag and pouch sealing systems, and the Damark brand of shrinkwrap packaging equipment. 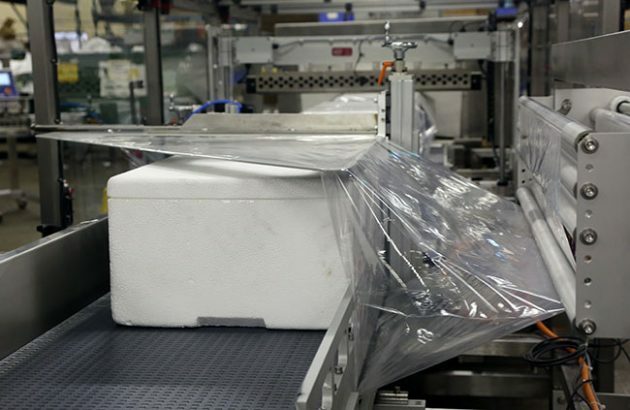 The fully-automatic Damark B34/180 HS-SS-N4 shrinkwrapping system manufactured by Plexpack is designed to 27 Styrofoam containers, filled with varying loads of fresh salmon and blocks of dry ice to keep the fish fresh during transit, per minute. With a proud track record of over 5,000 successful equipment installations worldwide to date, the company’s equipment has been used to tackle a diverse range of tough and unique packaging challenges in the past, but being asked to build a giant custom-made shrinkwrapping line for one of the world’s largest vertically integrated fishing and aquaculture groups was always going to be a truly titanic endeavour in terms of size, scale, scope and strategic importance. 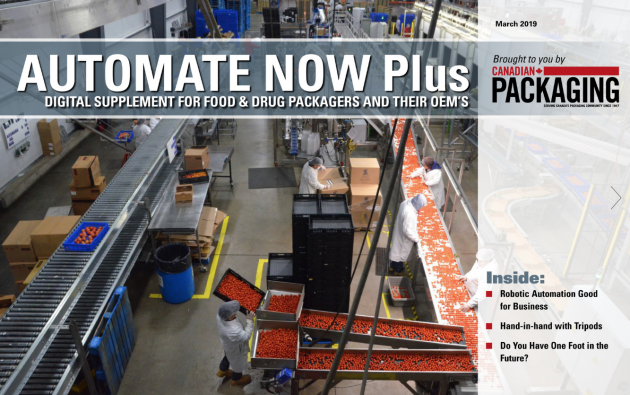 Despite the magnitude of the challenge, the Plexpack team rose to the occasion in every aspect of the project from start to finish—in an eagerly anticipated shipment and startup of a heavy-duty, custom-made Damark B34/180 HS-SS-N4 shrinkwrapping line at the customer’s fish processing facility last month. Designed specifically for shrinkwrapping of large-sized, high-strength foam cooler containers packed with salmon carcasses of varying weights—headless or with head attached—the entire line was assembled well within the project’s 20-week lead-time. “This machine is very important for Plexpack because it opens up many new doors to markets where we were not present before,” says Maria Alejandra Casanova, Plexack’s senior director for international sales and marketing manager for the Latin American market. 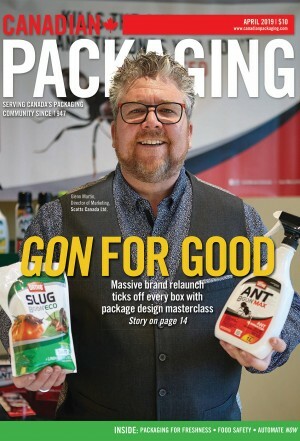 “Being part of such a big global industry, where Canada is also a major player, is a really big deal for us,” Casanova told Canadian Packaging during a recent visit to Plexpack’s 50-empoyee operation in Toronto’s east end. 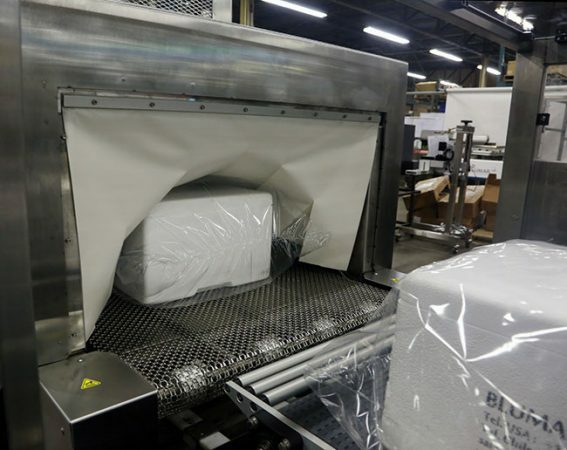 Featuring user-friendly machine controls and status indicators (inset) to facilitate simple plug-and-play operation, the custom-made Damark machine wraps the Styrofoam containers with high-strength clear polyolefin film before transferring them into the heat tunnel. As Casanova recounts, Plexpack’s local sales representative in South America was initially approached by the customer about half a year ago. A few conversations later, Plexpack sent one of its engineers to the costumer’s processing facility to take stock of the available space, environmental conditions, and other factors impacting the proposed project’s feasibility. “Proper machine design requires a full understanding of operating conditions such as temperature, humidity and all other key environmental factors,” says Casanova, holder of chemical engineering degree from the Central University of Venezuela in her native Caracas, and a master’s degree in chemical engineering earned at the Technical University of Munich in Germany. “It was also important to determine the speed at which the client wanted these boxes processed, as well as providing full enclosure for the contents. “It is a fully customized machine, designed specifically for this one application,” says Casanova, citing the system’s sanitary stainless-steel construction designed to withstand high humidity and frequent rigorous sanitary washdowns. 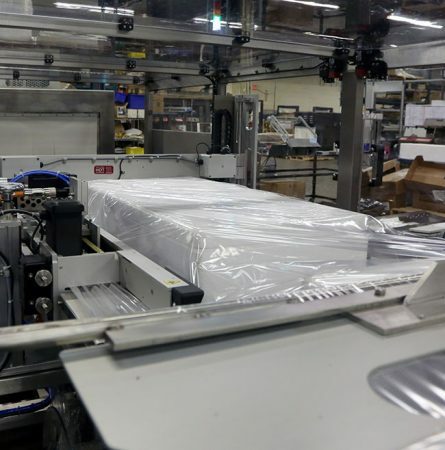 Combining proprietary Emplex continuous sealing technology and Damark wrap-and-shrink systems, the custom design begins with an infeed conveyor that transfers the loaded foam containers of product—typically packed in 70-, 40- or 35-pound loads—to be wrapped inside a layer of clear high-strength polyolefin film, after which they pass through a high-efficiency heat tunnel to seal the film tightly around the entire container, without any unsightly creases or air bubbles. “The client specified polyolefin film because it has a very nice finish that compliments the image that the company projects with the logo and graphics displayed on the side panels of the boxes,” Casanova notes. “Even though the boxes are eventually disposed of, the client wants to maintain good presentation throughout the entire distribution process because it’s very important to them from brand image perspective,” she states. While product protection and tamper evidence are the primary reasons for applying the shrinkwrap film all around the container, “It also helps to keep the white containers from getting dirty during transit,” Casanova points out. The custom-made Damark shrinkwrapping line uses the company’s proprietary continuous-sealing technology to wrap the protective polyolefin film layer around each foam container in a highly secure cross-seal pattern to ensure complete coverage around all sides. “It is very important for the client to be assured that the shipment will get to the customer looking in the same condition as it was when it left their processing facility,” she says. According to Casanova, the high-speed Damark B34/180 HS-SS-N4 system is designed to process up to 27 foam containers per minute—providing an effective alternative to traditional strapping methods used to keep the containers’ lids tightly in place during transit. “The market has been asking for an extra layer of protection to go along with the traditional strapping methods,” says Casanova, “and we are happy to deliver a solution that fits the client’s needs. According to Casanova, the entire machine can be typically operated and monitored by just one person. “There is definitely a big productivity payoff for the client in terms of reducing all the manual labor required to strap and wrap the containers manually,” Casanova points out. Boasting a NEMA 4 enclosure rating to allow the shrinkwrapper’s use in corrosive and extreme industrial environments, “The entire machine was built from scratch at the Toronto facility,” relates Casanova, noting that Plexpack is always keen on controlling its manufacturing and assembly process from start to finish. After being fully wrapped around all sides with the protective film, the Styrofoam containers make their way into the system’s high-performance heat tunnel to have the film shrunk tightly around all of the container’s contours without any tears or air bubbles. “As much as we can, we always strive to provide the client with a ‘plug-and-play’ solution requiring as little modification at their end as possible,” she notes. Shipped in a custom-made, giant crate built to keep the machine secure throughout its 45-day sea voyage to South America, the custom shrinkwrapping system is easily the biggest machine Plexpack has built in recent years, Casanova relates. As such, it will continue to enhance Plexpack’s stellar reputation and hard-earned market share growth that the company has enjoyed in Latin America in recent years. According to Casanova, Latin America currently accounts for over 20 per cent of the company’s total sales, with the U.S. and Canada still remaining the largest markets for Plexpack. All in all, Plexpack produces round 500 machines over the course of a year at its Toronto facility, with the Emplex brand of bag and pouch sealing systems accounting for the largest share of the facility’s production. 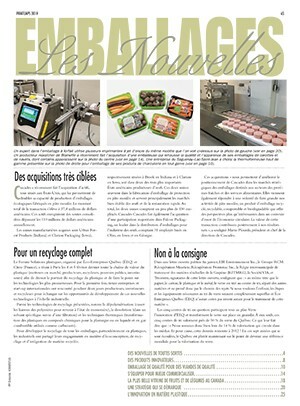 Expertly engineered to provide consistent, strong hermetic seals to keep various types of food products pure, fresh and secure, the Emplex sealers feature flexible modular designs that facilitates seamless connectivity to various optional add-ons such as barcode printers, gas-flushing systems, conveying and robotic handling, among others. 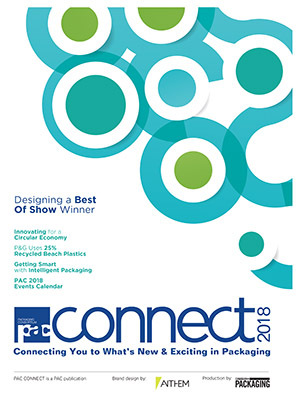 The comprehensive Emplex portfolio of continuous band sealers—ranging from heavy-duty to tabletop models—is available in vertical and horizontal configurations to provide superior performance sealing for a diverse range of product types and sizes packaged in stand-up, gusseted, wicketed, zippered and other bag types. 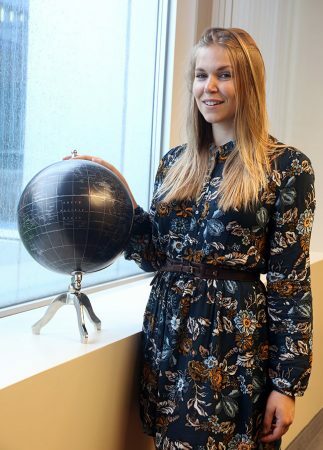 Plexpack’s marketing coordinator Jackie Irvine cites the company’s strong custom engineering capabilities as one of key reasons for its remarkable success in global markets. 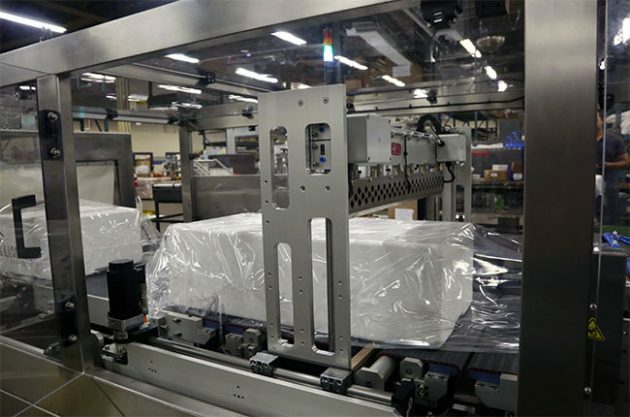 fully-automatic bagging systems to create bags from plain or pre-printed rollstock film by using side-sealing and cross-sealing techniques to form snug-fitting bags around products of any length or shape. 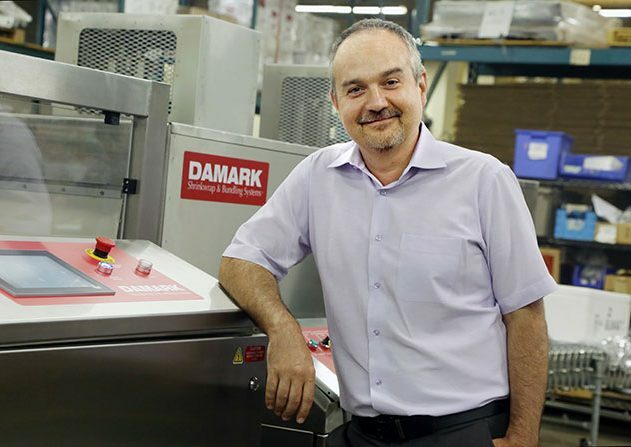 For its part, the Damark product portfolio comprises a comprehensive range of shrinkwrap and bundling solutions covering the whole gamut of packaging applications, including single products, multipacks, bottles and jars, trays and boxes, and all manner of odd-shaped and hard-to-wrap products. Many of these systems incorporate high-precision Damark brand L-Bars and shirk tunnels to provide plug-and-play combination systems designed to facilitate quick changeovers, easy film loading, intuitive controls, and precise seal and wrapping adjustments to create strong, reliable and accurate packaging for all sorts of products. In addition, Plexpack’s VacPack range of impulse vacuum sealers offers food, electronics and medical product companies a comprehensive offering of robust vacuum and gas-flush packaging solutions—available in floor-stand and tabletop versions—to handle a broad range of package sizes, including those for extra-wide and heavy products. 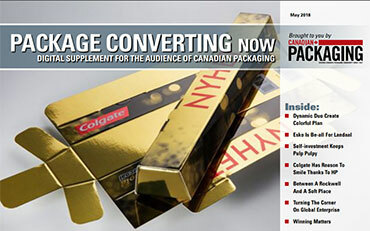 Headed by chief executive officer Paul Irivne, the company is a long-time active member of leading industry organizations such as PAC Packaging Consortium, PMMI-The Association for Packaging and Processing Technologies and the Canadian Produce Marketing Association (CPMA)—all of which strongly enhances its solid reputation as an elite Canadian machine-builder with world-class manufacturing competence and mindset.